Although Nigel Tosswill was a townie from Lower Hutt, he grew up with a passion for farming. Working for AMP as a rural valuer, he developed a broad understanding of farming investment and opportunities. In lending to farmers, AMP was second only to State Advances, which later became the Rural Bank. Through his job, Nigel travelled rural New Zealand, picking up on the most interesting agricultural innovations of the time. When he decided to go into farm ownership for himself, which he did in partnership with his cousin, Rex, what he focused on was potential, rather than the more obvious characteristics of a property. His son, Bob, takes up the story. “They found a Wairarapa property (then known as Muttonhole Main near Greytown) that, by the standards of the time, appeared to be impossible to farm. It had been cultivated and cropped after the war, which had taken all the fertility out of the light topsoil. By the time he looked at it, the stony land was overrun by gorse and rabbits. It was virtually written off. “Based on what he had witnessed elsewhere in the country though, Dad knew different and could see how to transform the property,” says Bob. Nigel and Rex, along with wives Eleanor and Audrey, took the gamble and got stuck in. Nigel carried on working off the farm and Rex set to work on a major development programme, fencing and clearing. “At the time, farmers knew how to farm the hills, where the main challenge was scrub and manuka, which they could deal with. However, they couldn’t manage the gorse on the plains, which on this farm was 10 feet high. It was so high they had to climb trees to see over it and confirm their bearings about the property. Dad had observed the advent of 245-T gorse spray, and that was the catalyst. A rabbit-proof ring-fence was the first job to confine the rabbits before shooting, trapping and poisoning them. “He also knew that the key to pasture establishment on light soil was consolidation. They converted an old ship’s boiler into a huge 18 ton water-filled roller, and bought a large Reid & Gray plough to work the light stony soil. An Allis-Chalmers HD5 provided the grunt to plough, level, roll and sow. For a townie, Dad saw things clearly,” says Bob. Although the plan was simple, its execution was long and demanding. “It was a big ask. They were the last of a pioneer generation in a way. My parents travelled over the Rimutakas from Wellington every weekend for 10 years to do their share and, although they managed to tame the gorse, the rabbits were another matter. Unlike Dad, my mother had a rural background, being a Rangitikei farmer’s daughter. Family legend claims that she shot 120 rabbits from the veranda of the bach in one weekend,” says Bob. Nigel had observed plenty of good farming practice through his AMP role, rising to head the farm lending department, and was an early adopter of rotational grazing, direct-drilling and self-fed silage to both cattle and sheep. 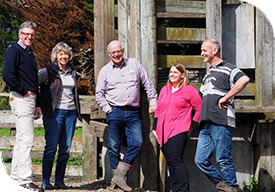 In 1962, Nigel and Eleanor bought out cousin Rex, renamed the property Allandale after a family connection in North Canterbury, and farmed with several managers until 1976, when Bob and wife, Jenny, took over in their turn. As sheep and beef fortunes waned with declining product prices, droughts and Rogernomics, the next 20 years saw many changes. Bull beef led towards dairy-related options, culminating in several years rearing over 500 calves on cows and heifers, and then on-selling the in-milk cows into the expanding South Island dairy scene. Jenny recalls this as a challenging and never-to-be-forgotten experience. “Not recommended unless you have good staff and a strong marriage. Broken ribs from an uncooperative cow was a highlight,” she says. Allandale became the economic base for Bob and Jenny to raise the next generation of Tosswills, sons Richard and Michael, and daughter Caroline. When first Richard then Michael decided they wanted to farm, that became another transformation point for the property. “As both boys were keen on hill country farming, we decided that the family’s tenure at Allandale had an end point. That decision was around 15 years ago. We have been in a succession planning process since. My father settled his sons into farming. Our challenge was to achieve the same for the next generation,” says Bob. Their objective was to maximise the economic performance of the farm, which they decided was best done by converting it into a specialised dairy support unit. After looking at successful support systems in the South Island, they started development. “We started from scratch, re-fencing and re-grassing the farm to set it up for dairy support with new lanes and water supply. Where previously, we were growing between six and nine tonnes of dry matter, we are now averaging over 12 tonnes. “Key to that has been the kale crop followed by barley, removing weeds and old pasture, and creating a clean seedbed for the modern cultivars to thrive. This year is the final phase of re-grassing and cow numbers wintered will drop back to a status quo level more suited to an annual re-grassing plan,” says Bob. 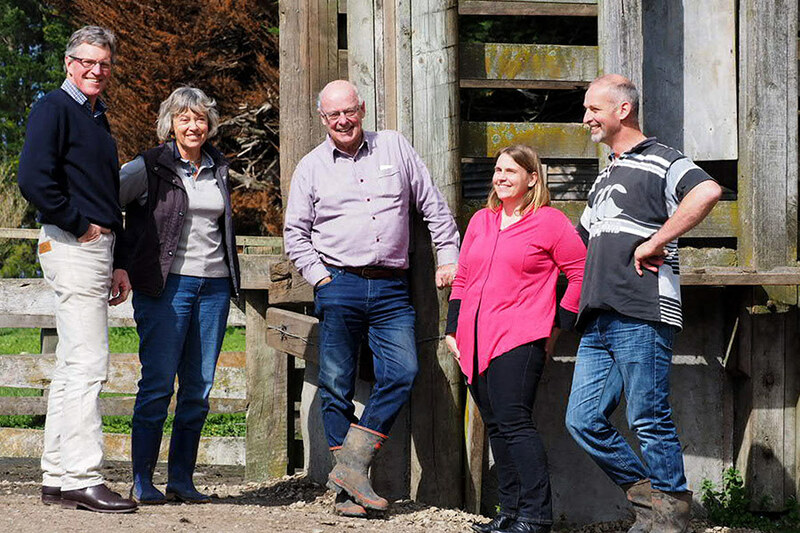 Development has taken five years to fully implement, with Bob working alongside farm manager, Bart Gysbertsen, who was 2013 winner of the Hawke’s Bay/Wairarapa Dairy Farm Manager of the Year. “When dealing with dairy farmers, having a well-respected dairy man leading the team was essential, giving them faith in our ability to deliver. Old sheep farmers don’t understand the questions, let alone know the answers. With heifer growth rates right up there, increasing the number of cows wintered from 600 to 2,000 during a highly challenging time for the industry shows how well Bart has delivered to their expectations. We have to show value rather than just cost, and we believe we have done that. 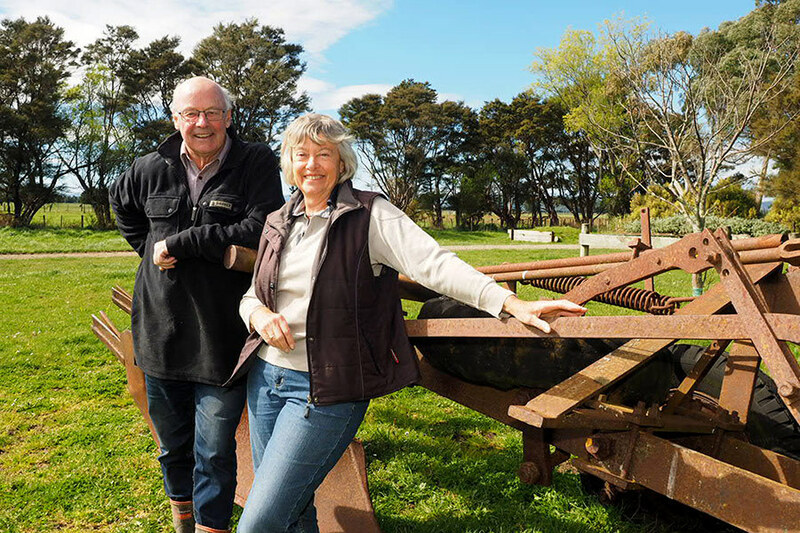 “Seeing the farm develop to what is probably its highest end-use has been very rewarding,” he says.Farm consultant, Mike Fleming of VisionAg, has worked with the Tosswill family for 20 years, and seen the transformation of Allandale over the past five years. “With all his knowledge and experience of successful farm businesses, Nigel fully understood the key aspects of value creation and Bob has been able to build on that since. These relate to ‘location, location, location,’ diversity of land use options, including non-farming uses, rainfall and scale. “Although Allandale has been able to achieve its potential under today’s terms of trade, as we know things change, and at the rate the world is moving with food disruption and farming constraints, who knows what is around the corner. Allandale stands as a safe long-term bet for people looking for inter-generational assets and able to enjoy an incredible lifestyle in a thriving region. “This is a special opportunity, in that with all this inherent value, the farm also has the capability to deliver solid economic return,” he says. After 67 years in the Tosswill family’s ownership, Allandale is now ready to hand on. John Murray of PGG Wrightson Real Estate, Masterton is marketing the farm, which he says is one of South Wairarapa’s most admired. “This is one of the largest flat contoured rural units in the Wairarapa valley. Its stony silt loam soils make it an outstanding farm for winter grazing and pasture production. Allandale has wintered around 2,000 dairy cows, plus around 1,000 dairy heifers grazed on-farm through the year. “With the recent re-development, it is now a profitable, stand-alone dairy support operation, with a highly competent, well- regarded manager, who is motivated to stay on under new ownership if required. 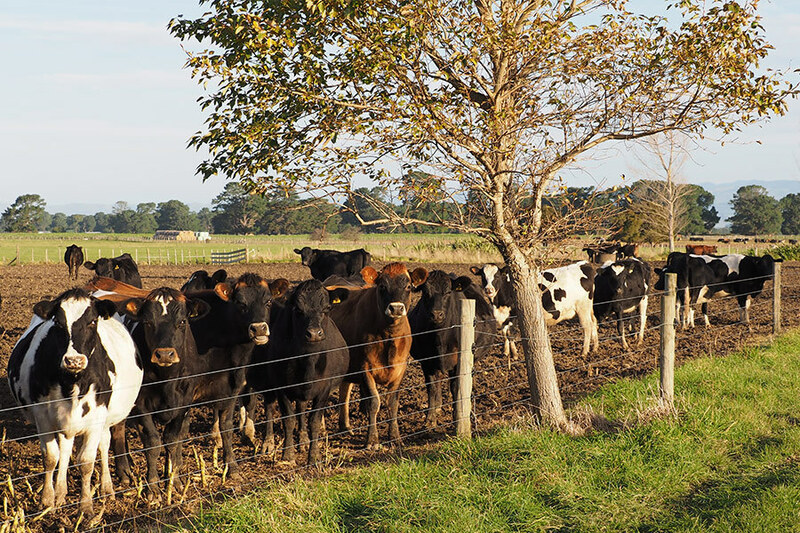 “It will have great appeal to corporate and family farmers operating in the dairy or beef production sectors who seek operational scale within the Wairarapa region,” says John. He is certainly a long way from boulders, gorse and rabbits, and testimony to nearly seven decades of Tosswill family stewardship, built on the vision of a Lower Hutt townie. To see more information on this incredible property, visit the Allandale Farm property page here.